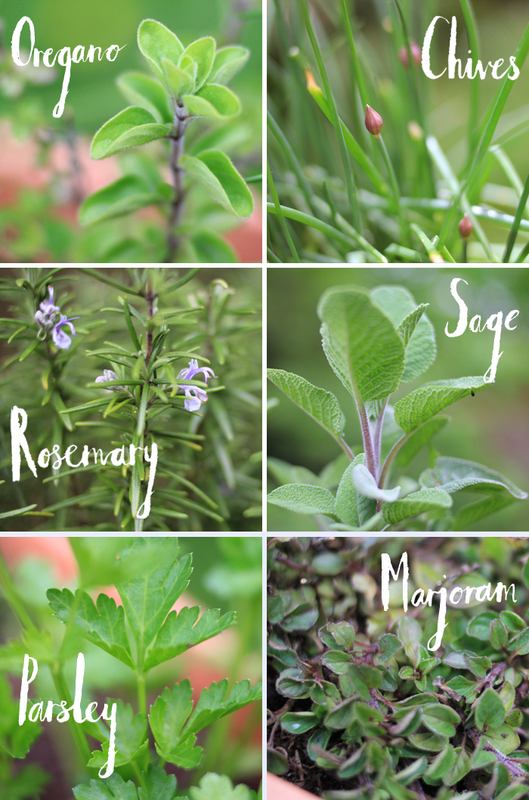 In my quest for a garden full of edibles, I have collected a rather alarming amount of herbs. I already had a fair few from three or four years ago, but I have been slowly adding more and more, until now there are planters covering almost all of my tiny garden. 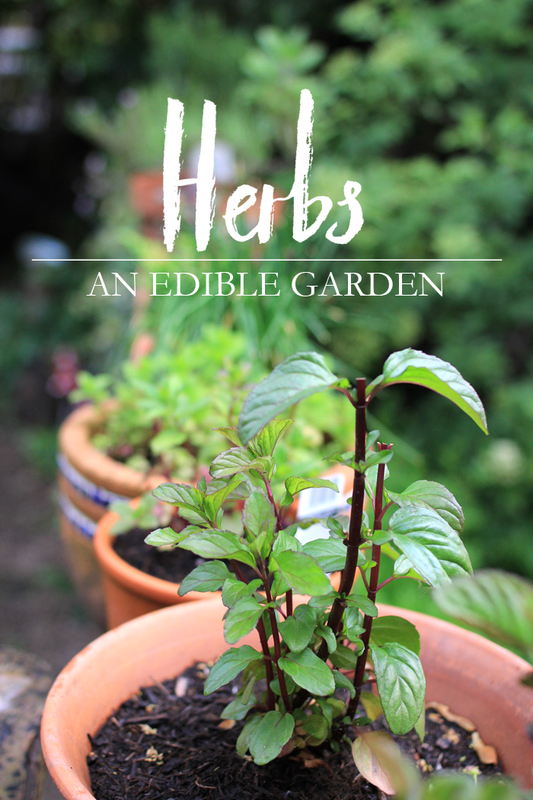 I started with herbs as they're probably the easiest of edible plants to keep alive; so long as they get enough water and sunlight they're happy sitting in pots. They're a lot easier to transport from rental to rental too and they can fit into the smallest of outdoor space. I love the process of popping into the garden to snip some herbs to serve with dinner or to have in juice or a cocktail, but really it is because fresh herbs taste so ridiculously nicer than their dried counterparts. I like to keep them as close to my house as I can, just so I don't have to walk all the way to the bottom of the garden every time I want to cook (which can be especially rubbish when it is tipping down with rain). I thought I would share with you my current collection and what I use them with the most. Oregano gets thrown into Italian style dishes and chives into soups and omelettes. Rosemary is paired with garlic and roasted with potatoes, whilst sage is served crispy with butternut squash. Parsley adds a kick to green juices and marjoram gets chopped into marinades for BBQ skewers. Garden mint ends up in juices and salads, basil mint goes into pesto, lime mint is always in mojitos and thyme makes for an unexpected addition to other cocktails. Mint is appropriately (considering my blog's title) my current favourite herb and I'm considering actually planting some in the ground, despite the fact that it will probably take over, as is its nature to. I can just never have enough of the stuff! If you follow me on Pinterest, you'll have noticed that I've got a bit of a cocktail thing going on at the moment. Truthfully I've always got a cocktail thing going on, but I've been particularly interested in looking for new things to try, especially recipes including herbs. I think some mixology experiments are in order and if any of them work I'll be sure to share them here! 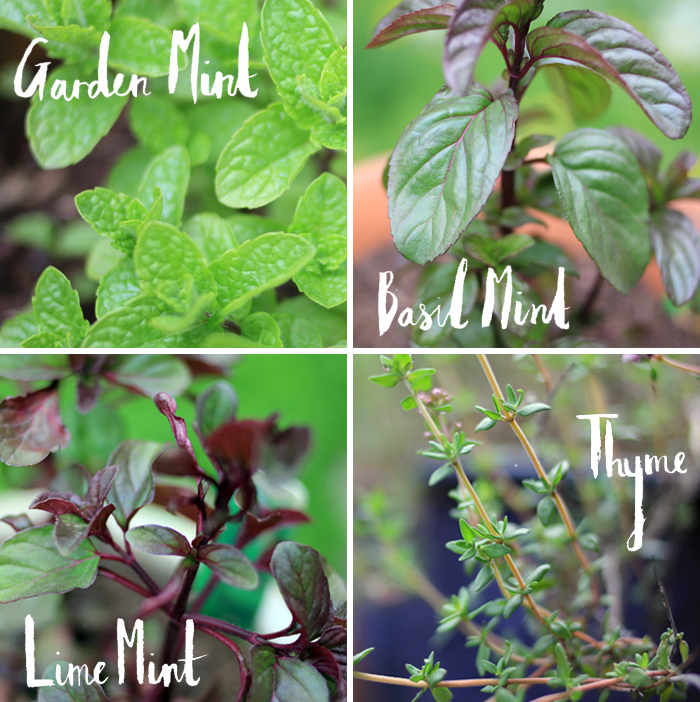 What are your favourite recipes that use fresh herbs? This looks amazing! I've always wanted something like this, but sadly I can barely keep the pot of chives on my windowsill alive. I miss the big area of chives in my parents' garden in Canada. So great for just nipping out and grabbing some to add to scrambled eggs, tuna sandwiches or salads! I'm growing cilantro, basil, lavender, sage, and rosemary on my little patio garden. They've been doing well so far. I love growing things in the garden, though this year my family decided to just do tomatoes and peppers, and maybe herbs later on, but I think my grandmother has more at her home! It's lovely to have fresh things a few steps outside! :) Great post!